Spirituality and religion are regarded as being out of this world. The very reason many religions regard themselves as 'spiritual' is because they offer us access to worlds other than the physical dimensions we find ourselves in. Spirituality is commonly used as an antonym for materiality. Yet there must be some commonality between our spiritual and material worlds for us to be able to imagine them at all. Access to such other-worlds is believed to permit us to extend our same earthly lives, to lead lives of greater civility or comfort, to consort with beings whose powers and intelligence exceed our own or to extend our powers beyond their earthly capabilities. While it's not possible to test the veracity of other-worldly claims, the descriptions of this world by many religions have proved to be scientifically inadequate, and this has aroused suspicion of their other-worldly offerings. Some have managed to avoid this conflict by simply regarding the wonder and beauty of nature to be an expression of divinity, as Pantheists do. But could divinity itself be a this-worldly rather than an other-worldly phenomenon? Could we find all the splendour of our spiritual imaginations here in our material world without having to resort to realms outlandish? Could spirits be coursing through our veins and singing through our minds using the elements of the Periodic Table? Spirituality might well arise out of, or be inherent in, our material world - and not a precursor to it. Science could be informing our spiritual imaginations rather than only contesting them. Rather than looking to spirituality as an antidote for materiality, this book explores it in a much wider sense - regarding any being, principle or object to be a spirit if it influences us while remaining mysterious or beyond our control. In this wider sense spirituality serves as a complement to science - a more intuitive and less restrictive vanguard into the unknown. We have no control over many of the material phenomena that affect us: The rotation of our planet vis-a-vis the sun, for example, absolutely dictates our daily rhythms, while the structure of our DNA is an important determinant of who and what we are. Dumb though these phenomena may be, their impact on us is unavoidable and in this wider sense they are spirits we cannot but obey. But are they sentient? Can such spirits be construed to comprehend meaning, experience sensation or express intent? I suggest they can, not necessarily in themselves, but in the patterns they host, in their sequences and arrangements. It's not just that their patterns may be beautiful or wondrous but they may themselves be patterned, and patterned again, in what I call orders of pattern. One has only to watch waves intermingling on a beach to see how deep this ordering can be. Our everyday lives are far too busy to contemplate the deeper orders of pattern but adepts of mindfulness tell us that it is possible to become aware of them. It is through the patterning of material reality that we express our sentiences, in all their nuances. The material world is a replete medium for meaning. The messages we communicate - words on a page, signs or songs, a pat on the back, exchanges of electronic data - all are patternings in the greater material medium. Our organs sense our environment through material signals and it is through material manipulations that we affect it. Spirits would utilize the material medium to express their sentiences too. But whereas our organs are confined to human-sized scales of activity, their avenues are not so limited. Their bandwidths in the material spectrum, as it were, are much wider than our own. Now I distinguish two modes by which patterning can occur. One mode is hierarchical, having levels of pattern that override each other, while the other is proportional, by which all patterns interlace equitably. These different modes can be seen for example in the way armies organize in strict levels of hierarchical authority while fish school without leaders. Our spirits would utilize these same modes in their patterning of reality and the main idea of this book is that we can glean information about our spirits from the modes of patterning they employ. Modes of patterning can also illuminate a contemporary psychedelic conundrum. Psychedelic drugs appear to offer us a unitary participation in the universe in addition to our usual participation as isolated individuals. Why is such a profound and important experience always temporary? Why is it so far removed from our normal perception of reality? Is the psychedelic experience illusory or is our normal perception illusory? These questions can be more readily addressed from a vantage of modes of patterning. A brief biographical note to allay suspicions about my motives: I grew up orthodox Jewish and as a teenager in the 1960’s was groomed for the rabbinate. On leaving school I chose to study physics and maths at university where I embraced atheism instead. In the 1970’s a chance encounter with psychedelics rekindled the spiritual interest, this time in the direct experience of spirituality rather than in the following of a religion. Attempts to reconcile the profundity of direct spiritual experience with the mundane physical world have occupied my attention ever since. This book is such an attempt. I have published another more intuitive work called the “Oracle of Love” based on the Taoist I Ching. 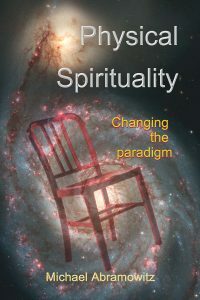 My aim in writing this book is not to convince sceptics of the reality of spirituality - only a direct experience can do that - but to offer those so mystified a framework that accommodates both their normal and spiritual states of mind. Part I examines the physical interactions that underlie these modes of patterning and establishes the characteristics of each mode. Part II shows how the meaning we extract from patterns of interaction follows the same two modes. Part III explores how spirits might negotiate these modes and Part IV looks at how an understanding of these modes can change our spiritual paradigms and better guide our psychedelic explorations. You may find the initial focus on physics wearying. I ask your patience. The physics is necessary for establishing the characteristics of the two modes but is elementary and accessible to everyone. Occasional statements that are beyond one's reach may be bypassed without losing the overall gist. On the other hand, I have stated the idea much too simply in order to convey it as directly as possible and to as wide an audience as possible. Many of the ideas in this book are speculative - but many are not. The physics is mainstream though the perspective a little unusual. It is in the realms of spirituality and consciousness that I have indulged because they would benefit most from these ideas. I have tried to enclose my speculations in phrases such as "I suspect ..." etc. The main argument is not dependent on these speculations so please put them aside if you find them uncomfortable. Appreciate too that I am grappling with radically different ideas and have probably made mistakes along the way. Inform me of indiscretions or approach me for more detail through the email address on the front page. I hope you find this adventure as ingenious, useful and entertaining as I have.